Children gather at a makeshift school at the IDPs Abagena camp in Benue, Nigeria, April 11, 2018. FILE - A girl scavenges at a garbage dump in a street in Sanaa, Yemen, July 26, 2017. “While we’re seeing some progress in many countries, when it comes to childhood-disrupting events like early marriage, exclusion from education and poor health, progress is not happening quickly enough for the world’s most vulnerable children. Save the Children is committed to making sure every last child has the childhood — and the future — they deserve,” said Carolyn Miles, president and chief executive officer (CEO) of the agency. 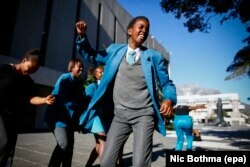 South African schoolchildren from Chris Hani High dance during Africa Day celebrations at the Artscape Theatre in Cape Town, South Africa, May 25, 2016. 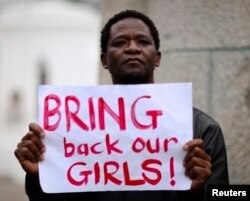 A protester holds a sign during a march in support of the girls kidnapped in Nigeria by members of Boko Haram, in Cape Town, May 8, 2014. Many economists describe Africa’s burgeoning rate of growth as a “demographic dividend” for prosperity. But child health advocates warn that without improved investment in education and health, the dividend could become a curse.